Breaking News! Early Acceptances for the BISV Class of 2017! St. At BASIS Independent Silicon Valley, the college counseling process begins in earnest in grade 9; we pride ourselves on offering our students a myriad of opportunities to prepare for and think about their options for college. Throughout the year we host grade-specific college counseling informational nights in which counselors address common questions and concerns they are receiving from parents. Our hope is to demystify the application process so when students arrive to the senior year our families feel well prepared to jump into college applications. The fall is our college visit season. Admissions representatives from all over the country visit our campus in order to talk to our students about the specialties of the university they represent, campus culture, and the admissions process. These sessions provide invaluable insight into what the school is looking for in prospective students. This fall, we were fortunate to host 40 colleges, ranging from Cal Tech to NYU to Princeton. Over the summer, we host trips to visit colleges in a particular region of the country. In the past, we have visited the Northeast and Midwest. During the spring we hold college counseling boot camps. Students will meet by grade with a college counselor in grade-appropriate workshops. For instance, among the subjects covered for freshman will be the basics of our college counseling software, the fundamentals of building a college list, meaningful skills for researching colleges (i.e. ; what to look for beyond brand name) as well as the basic differences between different types of colleges and universities. The sophomores will concentrate on these same basic topics but delve a bit deeper as well as learn about the seriousness of the junior year and even explore university options abroad, particularly in the UK. Both grades will receive guidance on course selection and testing options. Boot camp for the juniors is the most rigorous of all. Students will begin making decisions about who to request letters of recommendation from, what types of content to include in their application essays and will conduct deep research into different universities as they edge closer to compiling a list of schools they’ll eventually apply to. 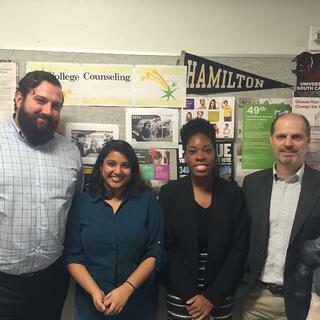 In their senior year, students have a dedicated, daily college counseling class. This class allows for close mentorship from the college counselor and carves out time in the students’ days to chip away on their applications. During the course of the class students will have their admissions essays reviewed by the college counselor (usually several times), they will finalize letter of recommendation requests, practice interview skills, and much more. Stay tuned for the full list of acceptances from the regular admissions cycle later this spring! Join us at an upcoming informational event to learn more about how our students are achieving these incredible results!